Indian Coast Guard has got another boost to its force with the induction of the fifth in the series of the new 105M Offshore Patrol Vessel (OPV) “ICGS SHAURYA”, a state-of-the art vessel built by Goa Shipyard Ltd (GSL) using its in-house design. Hon’ble Petroleum Minister, Shri Dharmendra Pradhan dedicated ICGS “SHAURYA”, the largest and most advanced new generation OPV to the Nation at an impressive ceremony held at GSL on 12th August 2017 in the distinguished presence of Director General Coast Guard Rajendra Singh, RAdm Shekhar Mital, CMD, GSL and other dignitaries. 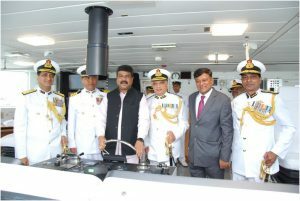 Hon’ble Petroleum Minister, Shri Dharmendra Pradhan stated that the Coast Guard, with its various activities, has been doing a commendable job of protecting our sea frontiers and EEZ from adverse elements, which will help strengthening nation’s overall security and prosperity. Induction of such vessels works as force multiplier. Praising the build quality & technological advancement of the ship built by GSL, Petroleum Minister said “We all are proud of Goa Shipyard Limited. The kind of modern technology, advanced equipment and amenities embedded in GSL built ship, are not found even in international ships. It demonstrates our technical prowess and competencies of GSL- a proud PSU”. Significantly, this Vessel has registered excellent performance at sea during trials, clearing all trial parameters comfortably and achieving over 26 Knot speed, as against contractual speed of 23 knots. Despite 5.35% higher displacement as compared to previous ships, fuel efficiency is improved by 16.36%, endurance is increased by 14% besides much improved crew-comfort, ergonomics and head space etc. It has 18% smaller turning circle diameter, thereby providing improved maneuverability and capability to get into combat position expeditiously. Addressing the gathering, Director General Coast Guard Rajendra Singh highlighted the strong symbiotic relationship of mutual cooperation between Goa Shipyard and Coast Guard and stated that the excellent quality of the OPVs delivered by GSL are testimony to its innate capability and strong commitment to Customers, which has gone a long way in assisting Coast Guard achieve its Capital Expansion plan. RAdm Shekhar Mital, NM, IN (Retd) CMD, GSL who is credited with the remarkable turnaround of the shipyard in last three & half years highlighted “GSL has delivered 06 OPVs in last 21 Months, all ahead of schedule at an average gap of 4 months. This ship has been delivered 31 days ahead of schedule and has taken 3 years to build. The last two deliveries of OPVs, one for Srilanka Navy and this splendid one, were made within a short span of 15 days. There are very few parallels of this kind of delivery and execution performance that exist, in Indian ship building industry and compares favorably with International Shipbuilding standards”. ADG K Natrajan, Commander Western Seaboard, FOGA RAdm. Puneet Bahl, Directors Mr S P Raikar, Cmde B B Nagpal and Senior Officials of GSL and Coast Guard, Government, were also present during the Commissioning ceremony.